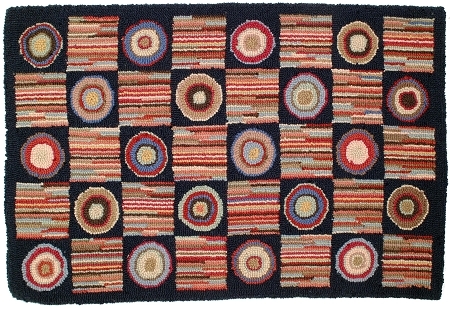 H 650 Bullseye 2'x3' Handtufted Wool Rug (CLICK SIZE BUTTON FROM DROP DOWN MENU BELOW TO SEE SIZES AND PRICES). H650 Bullseye. 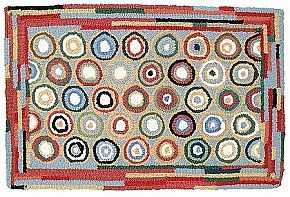 Wool Hooked Rug. 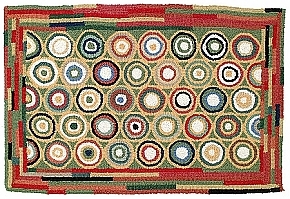 This rug is from a two types of classic traditional hooked rug designs --- the circle with various colors and the "hit or miss" lines in every other box. This simple design is so eloquent in its simplicity, but more importantly allowed the weaver to use "whatever" scraps of yarn were available. The beauty of striped backgrounds in many a New England and Canadian rug rivals the work of Orientals. 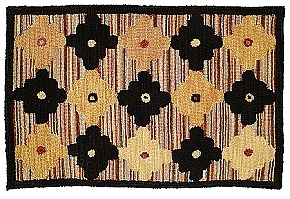 It is one of the valuable contributions to rug design given by hooked rug workers.